Revelation 3:14 was written by the apostle John on the island of Patmos, exiled for his faith. He was writing to the seven churches under the inspiration of the Holy Spirit. And what a message it was! One that has convicted me more than once in my spiritual journey. I’m not writing about the letter, though. I’m writing about the Name. I’m writing about Jesus, The Amen. The Hebrew word, amen, means: surely, indeed, truly. It’s root word, aman, means: to be firm, steadfast, trustworthy, faithful. 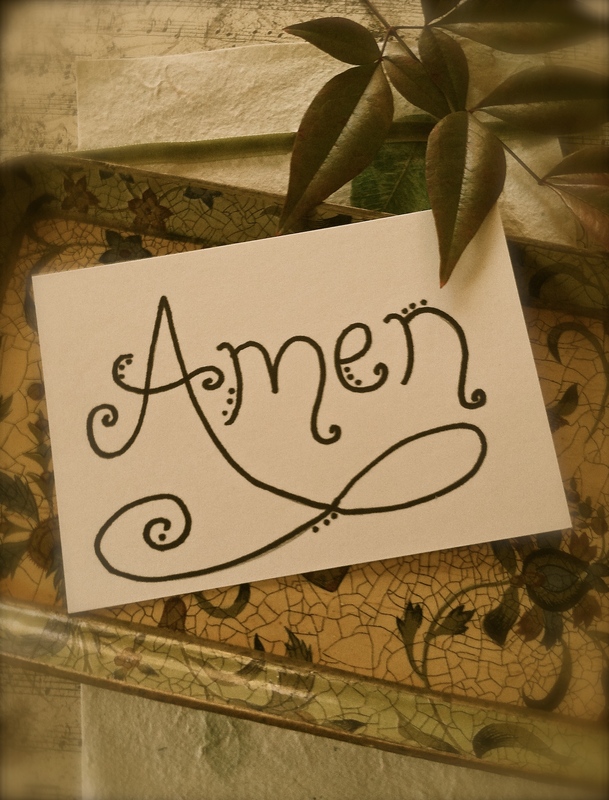 When we say amen at the end of a prayer, we’re saying we agree with the words we’ve prayed. When we interject amen during a pastor’s sermon, or a Bible teacher’s message, or a friend’s wise advice we’re saying we wholeheartedly agree. We’re confirming we believe what is said is true. We throw this word around a lot, but somehow I think Amen-ing is serious business. I know it doesn’t always sound so serious and sincere when I say it. I’ve been known to take the more southern pronunciation and draw out the A with pomp and circumstance…you know what I’m talking about…with a long A and a singsongy voice…. A-A-A-a-a-MEN! Let’s not forget the Hallelujah’s and the Praise-the-Lord’s that follow. I can’t help it. It just comes out in one long profession of faith. I say it. I proclaim it. I mean it. Somehow, the longer I walk with Jesus, the more I cling to Him, the more I earnestly seek Him, I come to believe Jesus is The Amen in my amen’s. I want to live an Amen life. A life that says Jesus is faithful. A life that says Jesus is trustworthy. A life that says Jesus is unchanging. The Alpha and the Omega. The Beginning and the End. And everything In-Between. The Same yesterday, today and tomorrow. The Forever One. Oh y-e-s, sir! I hear an A-A-A-a-a-a-MEN! threatening to quake the walls of my heart and shake the foundations of my soul. There is power in an amen that truly believes. However I say it, however I proclaim it, however I shout it out, when it comes from steadfast faith it speaks right into the heart of The Amen. Jesus is the Amen of God. He made a way for me to the Father. He is my way. My truth. My life. All that I am is because He is. All that I need is fulfilled because He gives. All that I crave is satisfied because He sustains. All that I hope is realized because He promises. And so I continue to amen The Amen. As much as I can, for as long as I can, I will strive to live it. Breathe it. Believe it.